It was rumored on Orangebloods and Hookem.com earlier this week but early this morning the Longhorn Network went live for AT&T U-verse customers across the country. Longhorn fans everywhere are dancing in the streets over the news that they’ll get the chance to watch the season kickoff tomorrow against Wyoming live on LHN. There wasn’t an official press release until late this morning, but LHN started showing up as channel 1609 (standard def 609) sometime overnight and by the 8am Twitter was blowing up with fans and former Horns fired up about getting access to the network. Adding U-verse probably triples the number of people in the state of Texas that now have access to the network and gives them a second large national carrier (along with Verizon FiOS.) This is great news for Texas fans and could help nudge Time Warner, Comcast, DirecTV, et. al. into adding the network as well. We have completed a quarter of the season and it’s time to start looking at conference match ups for the Horns. But before we get back to football, I want to look back at Realignment Armageddon 2.0. We can surmise that the Big 12 is back together and everything is back to normal. (Who believes that?) I do think we need to take a look at what was lost. Here is what I believe the PAC 16 would have looked like if Larry Scott and the rest of the universities on the left coast would have opened the door to the 4 schools in the East. The pod system would have played out by having the schools in the East only having to travel to the western time zone twice a year for football. The teams would play a home and away series for two years and switch to the other remaining teams in that pod. The travel schedule for most of the other university sports would be quite different due to the size of this conference, but we all know that football pays the bills. The media markets that this league would boast would cover 12 of the major 28 markets including the biggies such as LA, SF, Houston, & DFW. Here is a look at the possible football schedule using the pod system for the Longhorns for the 2012 and 2014 season. The odd years would result in the teams switching destinations to accommodate the home and away series. The OU game would still be played at the Cotton Bowl every year. The remaining 3 non-conference games of the season would be a host of cupcake teams to offset a brutal but highly entertaining regular season (goodbye A&M)! The University of Texas has a contract with ESPN for the Longhorn Network that pays it at least $300 million over the next 20 years. For those who don’t know what that word means Wikipedia defines a contract as, “a legally enforceable agreement between two or more parties with mutual obligations.” You can’t just decide you don’t want to be in a contract anymore because you feel like it. There are penalties and repercussions. What no one (both journalists and message board experts) seems to mention when they suggest Texas should head to the new Pac 16 and dump LHN is that it may be worse than sacrificing millions in possible revenue. Texas might owe ESPN some huge sum of money for breaching the contract if they want to kill it. 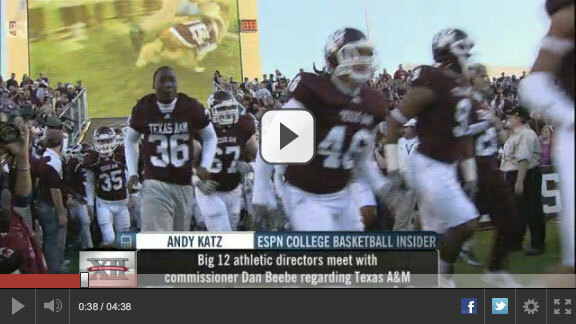 Not only do UT, DeLoss Dodds, Bill Powers, and the BOR need to decide to modify Longhorn Network but ESPN would as well. What’s in it for them to do so when one of the reasons Texas got such a good deal on LHN was ESPN didn’t want super conferences?? Texas and OU headed west to form Pac 16? Comments Off on Texas and OU headed west to form Pac 16? The Longhorn Network is coming, in HD, for Texas subscribers to Verizon FiOS TV packages. The LHN will be near the other sports programming on channel 579 (79 for standard def) for FiOS TV Prime HD, Extreme HD and Ultimate HD subscribers that live in Texas. Fans in other states will need to be Ultimate HD subscribers (the most expensive package) to see their Horns. Joining a growing lineup of regional and national collegiate sports networks on FiOS TV, the Longhorn Network has arrived on FiOS just in time for the start of the college football season. The Longhorn Network is a channel devoted to athletic programming and related activities at the University of Texas. Verizon is the largest video service provider to date to announce the addition of the Longhorn Network to its channel lineup. The national distribution agreement with the Longhorn Network will allow fans of FiOS and the Longhorns to start watching the network on Sept. 1. FiOS TV Ultimate HD subscribers outside of Texas can watch LHN on Channel 320. In Texas, FiOS TV Prime HD, Extreme HD and Ultimate HD subscribers can watch LHN on Channels 79 (standard definition) and 579 (high definition). In the near future, the Longhorn Network also will be available online, on tablets and on smartphones for fans with a Verizon FiOS TV plan, making UT athletics and other programming easily available anywhere, anytime. I’m not quite as sure why the SEC wants A&M, because other than getting its toes into the state of Texas – assuming College Station counts – this is like a high-end mall expanding to add a Walgreens. From Jeff Schultz at the Atlanta Journal-Constitution. This move specifically is done because Texas A&M didn’t like the way Texas was getting favored status from the Big 12. They didn’t like being treated as the second child. A&M has been in the shadow of Texas for quite some while now. Too bad for the Aggies. Instead of being little brother to Texas and Oklahoma whipping boy, they’ll now be fighting Mississipi State for fifth place in the SEC West. Aggie fans somehow think they’ll be better in SEC. They couldn’t consistently beat Texas Tech and Baylor but think they can hang with Bama and LSU. The Sporting News’ 50 greatest coaches of all-time released recently caused a lot of conversation on sports talk radio. They polled 118 ex-players, coaches, and other experts and pegged [tag]UCLA[/tag] great John Wooden as the all-time greatest coach. 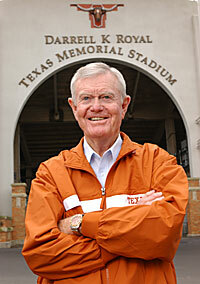 But Darrell K. Royal absolutely must be included. Without question, he has become the most overlooked great coach in the history of the game. He won three national championships, and I don’t want to hear cracks about his UPI title before the Cotton Bowl loss to Notre Dame in January 1971 because he won it under the rules of the day. Think split national titles, LSU and USC. What do you think? Is Royal one of the greatest coaches of all time?